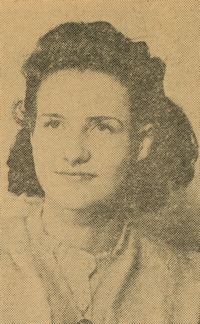 Obituary – Abbott, Audna Estelle (Silver) « Perry High School Alumni Association, Inc.
– 17, daughter of Mr. and Mrs. R. T. Silver of Perry, was born in this city, but attended school in Enid for 10 years. Her birth date is June 21, 1923. Estelle has been attending Perry schools for only two years, but is a member of the Red Hots, Queen Esther, Science club, and Rainbow girls. Collecting costume jewelry and pennants of other schools are her favorite hobbies. She plans to be a nurse after graduation. Audna Estelle Abbott, 89, homemaker, died on Friday, March 15, 2013 and was interred at Grace Hill cemetery in Perry, Oklahoma. The daughter of Roger Tallman and Cleo Faye (Ashby) Silver, she was born June 21, 1923, in Perry. She graduated from Perry High School in 1941 and was united in marriage to Preston Abbott November 27, 1947 at Arkansas City, Cowley County, Kansas. Estelle was preceded in death by her parents, one brother, Roger Silver, and her husband, Preston Abbott.